South Korea’s financial regulator said Wednesday it will allow unprofitable but promising startups to go public by revising the market listing requirements. The decision comes amid a global phenomenon where newborn firms rise as powerful industry leaders helped by funds from capital markets, such as Facebook and Tesla, while Korean startups are experiencing difficulties in being listed on local stock markets. The Financial Services Commission unveiled its plan to add some guidelines by the end of the year to the current requirements for market listing and initial public offering in order to widen opportunities for cash-stripped or unprofitable startups. Listing overseers, mostly investment banks and securities firms, will be able to recommend promising startups across sectors to go public. Currently, listings of newly established firms have been possible based on overseers’ evaluations on the firms’ technologies, but it is limited to biotechnology firms. Besides the technological evaluation, the FSC said it hopes to give overseers more autonomy to discover new firms with growth potential from various industrial sectors. In order to minimize retail investors’ investment risks, the regulator decided to give them put-back options for six months after listing that would enable a refund of up to 90 percent of the investment at IPO prices. To prevent possible moral hazards by overseers, those who recommend inappropriate firms for three years will be barred from making recommendations for one year. Overseers are also be required to unveil reports gauging the growth potential of startups to all investors. In addition, unprofitable businesses will be able to apply for listing on the Kosdaq if they meet one of the following qualifications. 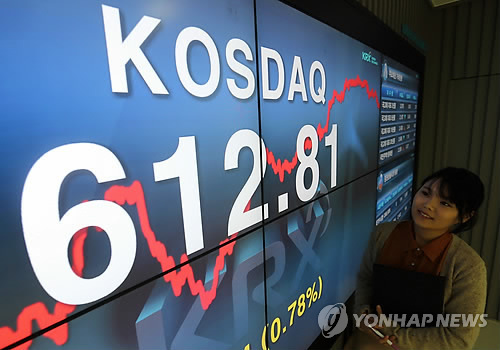 Firms with annual sales of over 3 billion won, which saw more than a 20 percent sales increase for the previous two years, can go public on the Kosdaq with least 50 billion won in market capitalization. Or, those with over 50 billion won in market capitalization and whose price book-value ratio is over 200 percent, can apply for the Kosdaq. Until recently, companies with less than 2 billion won in net profit haven’t been allowed for market listing. The FSC plans to implement the measures by the end of the year.